On 16 May 1770 Maria Antonia Josepha Johanna von Habsburg-Lothringen married Louis-Auguste de France, in a lavish ceremony at Versailles, in front of more than 5000 guests. Guests were admitted only if they had a ticket, although many curious people flocked to the palace to try and get a glimpse of the royal couple. Even those who were officially invited, though, had to wake up really early in the morning (the Duchess of Northumberland was up at 6 am!) to get dressed and reach the palace in time. On Wednesday, the 16th of May, at nine o’clock, Marie Antoinette left La Muette for Versailles, where her toilette was to take place. The king and the dauphin had preceded her the evening before. When she arrived at the chateau, the king received her on the ground-floor, discoursed for some time with her, and presented to her Madame Elisabeth, the Comtesse de Clermont, and the Princesse de Conti. At one o’clock she went to the apartment of the king, whence the cortege started for the chapel. 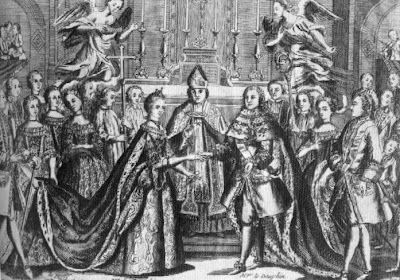 The dauphin and the dauphiness, followed by the old monarch, advanced toward the altar and knelt on a cushion placed on the steps of the sanctuary. The archbishop of Rheims, Monseigneur de la Roche-Aymon, grand almoner, offered them the holy water, then after having exhorted the young couple, blessed the thirteen pieces of gold and the ring. The dauphin took the ring and placed it on the fourth finger of the dauphiness, and gave her the gold-pieces. The archbishop pronounced the nuptial benediction, and as soon as the king had returned to his prie-Dieu, opened the mass. The royal choir sang a motet by the Abbe de Ganzargue; after the offertory the dauphin and dauphiness went to make their offering. At the Pater a canopy of silver brocade was spread above their heads, — the bishop of Senlis, Monseigneur de Roquelaure, grand almoner to the king, holding it on the side of the dauphin, and the bishop of Chartres, grand almoner to the dauphiness, holding it on the side of that princess. 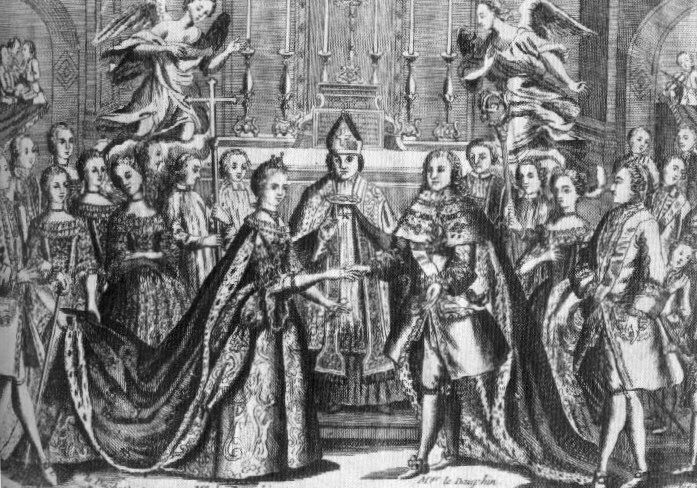 At the end of the mass the grand almoner approached the prie-Dieu of the king and presented to him the marriage register of the royal parish, which the cure had carried. Then the cortege returned to the king’s apartment in the same order, and the dauphiness, after going to her own apartment, received the officers of her household and the foreign ambassadors. An immense crowd filled the royal city. Paris was deserted: the shops were closed; the entire population had betaken itself to Versailles to assist at the celebrations and fireworks which were to finish the day. But at three o’clock the sky became overcast; a violent storm burst; the fireworks could not be set off; the illuminations were drowned by the rain; and the crowd of curious people who filled the gardens and streets were obliged to flee in disorder before the peals of thunder and torrents of rain. In the chateau, however, the day ended brilliantly. 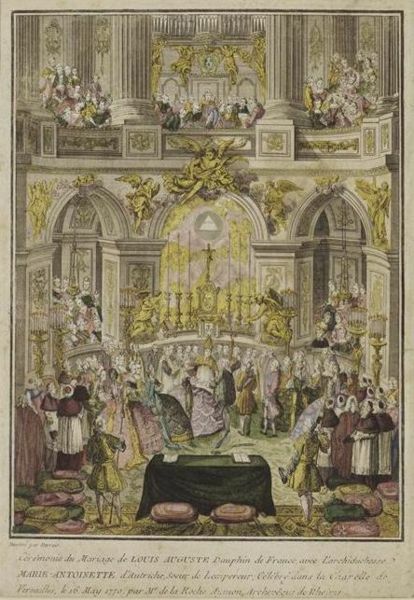 The courtiers, in sumptuous attire, eager to see and above all to be seen, crowded the apartments; a magnificent supper was served in the theatre, transformed into a banqueting-hall and lighted by “a prodigious number of candles.” “All the ladies in full dress in the front of the boxes presented a sight as surprising as it was magnificent.” The court had never seemed so brilliant. At six o’clock a drawing-room was held, games of lansquenet, and a state dinner. In the evening the king conducted the newly married couple to their room. The archbishop of Rheims blessed the bed. The king gave the chemise to the dauphin, the Duchesse de Chartres to the dauphiness. But despite the splendour of the celebrations and the promising aspect of the future at that moment, certain obstinate pessimists could not help regarding the rumbling of the storm as a menace from Heaven; and the superstitious recalled that the young wife, in signing the marriage register, had let fall a blot of ink which had effaced half her name. Maxime de la Rocheterie’s account left out an important detail, though. Well, important to us women: the dress. What did the young Marie Antoinette wear on her wedding day? Unfortunately nothing remains of her wedding dress, bar a few descriptions by contemporaries. From them, we learn that the bride, who appeared smiling and poised and no older than 12 (she was 14), wore a brocade gown with a long and heavy train. Her whole small figure glittered with diamonds. However, the dress didn’t fit her. Despite the ladies of the court’s best efforts, the dress couldn’t be completely laced in the back, which meant that Marie Antoinette’s shift shew through, as the Duchess of Northumberleand remarked: “the corps of her robe was too small and left quite a broad stripe of lacing and shift quite visible, which had a bad effect between two broader stripes of diamonds. She really had quite a load of jewels.”** The bridegroom instead, who, according to the Duchess, looked timid, trembling and worn out with anxiety, wore a suit of cloth of gold covered with jewels and orders. The young couple was truly a dazzling sight.